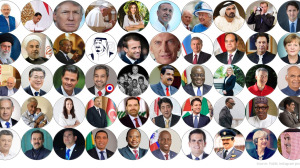 Burson Cohn & Wolfe (BCW) has released the Twiplomacy Study about the most followed 'World Leaders on Instagram', which shows that 92 heads of state, 48 heads of government and 36 foreign ministers have personal accounts on Instagram. Here's what the results of the study have revealed. Indian Prime Minister Narendra Modi is the most followed world leader on Instagram with 14.8 million followers. He is followed by Indonesian President Joko Widodo with 12.2 million followers, who more than doubled his followers over the past 12 months. With 10 million followers, United States President Donald Trump is in the third position. Pope Francis is in the fourth position with 5.7 million followers, just ahead of Queen Rania of Jordan, Turkey’s President Recep Tayyip Erdogan and the White House account, each with more than four million followers. The United Kingdom royal family has almost tripled its followers over the past 12 months due to the pictures of the royal wedding of Prince Harry and Meghan Markle, which increased the account’s followers by 570 000 on Saturday, 19 May. As of Monday, 1 October, the accounts have a combined total of 98.3 million followers and published 98 372 posts in the past 12 months, which have garnered a total of 860.4 million interactions (comments and shares). Trump leads the rankings in terms of total interactions (comments and likes). Over the past 12 months, @realDonaldTrump has garnered more than 218 million interactions, more than three times as many as Indian Prime Minister Narendra Modi who has more followers but only 69 million interactions on his 80 photos and videos over the past year. However, considering the number of interactions (comments and likes) per post, India’s Prime Minister Narendra Modi is the most effective world leader on Instagram, with each of his 80 posts receiving, on average, 873,302 interactions. Turkey’s President Erdogan is in the second position with 413,934 interactions and Indonesia’s President Joko Widodo’s Instagram posts receive an average of 411,673 interactions per post. “This third installment of the BCW study shows Instagram has become the social media network where world leaders garner the most interactions,” said Chad Latz, Chief Innovation Officer, BCW. Instagram is not the most obvious social network to make sweeping policy statements; however, Instagram Stories have become a secondary channel for digital diplomacy, where word leaders meet, greet and tag each other. Ghana’s President Nana Akufo-Addo is sub-Saharan Africa’s most followed leader on Instagram with 431 248 followers, ahead of Rwanda’s President Paul Kagame and Nigerian President Muhammadu Buhari with more than 160 000 followers each. Jordan’s Queen Rania is the most followed Arab leader with more than 4.8 million followers, surpassing Sheikh Mohammed, the Vice President and Prime Minister of the United Arab Emirates, with more than 3.3 million followers. Argentina’s President Mauricio Macri is the most followed Latin American leader on Instagram with 880 000 followers ahead of outgoing Mexican President Enrique Peña Nieto and Paraguay’s Mario Abdo Benítez, who each boast more than half a million followers. The British Royal Family tops the Instagram ranking in the European Union with 3.5 million followers, ahead of French President Emmanuel Macron with 1.1 million followers, and Germany’s Chancellor Angela Merkel with 684 000 followers. The Information Department of the Government of Brunei is the most active government account, with more than 17 posts per day on average. Imran Khan, Pakistan’s Prime Minister, is in the second position with more than 10 posts per day and the Foreign Ministry of Kuwait is the third most prolific with more than eight posts per day. Since June, 15% of the 426 accounts have created Instagram TV (IGTV) channels, which allow users to upload up to 60-minute-long videos in vertical format. World Leaders on Instagram is BCW's latest research into how world leaders, governments and international organisations communicate via social media. The research builds on BCW’s annual Twiplomacy Study, which is now in its sixth year. In 2016, the Twiplomacy Study was expanded to cover all key social media platforms and has enhanced BCW’s digital reputation worldwide. The study analyses the activity of the 426 Instagram accounts of heads of state and government and foreign ministers, 100 more than in the 2017 study, using aggregate data from Facebook’s CrowdTangle tool. For more information, visit www.twiplomacy.com. You can also follow Twiplomacy on Facebook, Twitter or on Instagram.